I like to grow celery to enjoy fresh at the table, which is best accomplished by growing two types of celery. Cold-hardy cutting celery (Apium graveolens var. secalinum) grows as a true biennial, providing a generous crop of crisp, hollow stalks in spring and again in fall. For summer harvest, I grow three or four plants of regular celery (Apium graveolens), and treat them as cut-and-come again vegetables rather than holding out for big hearts. Both types of celery can be grown from seed started indoors in spring. Tiny celery seeds are slow to sprout and grow, but growing celery seedlings is worth the bother if you seldom see them offered for sale in your area. You will almost certainly need to start from seed with lesser-known cutting celery, but you may need to plant it but once. 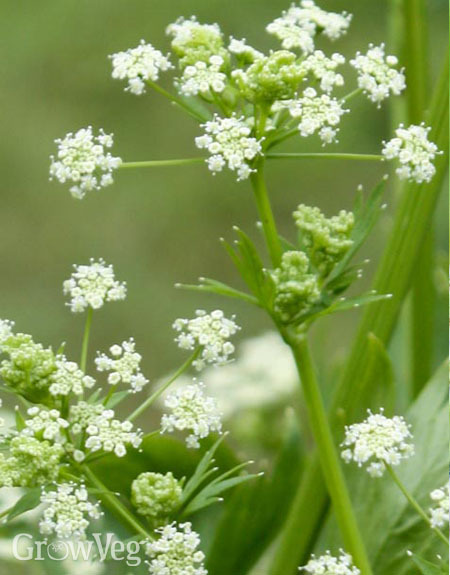 When properly managed, cutting celery easy establishes itself as a reseeding biennial, producing umbels of white flowers in summer which give way to a rain of little celery seeds (yes, the edible kind). When I allow only one large cutting celery plant to stand until it sheds its seeds, I see plenty of volunteer plants for the next two years. Recently a gardening friend expressed an interest in growing celery until he saw the miniscule size of the seedlings and heard how long it takes to grow them – up to 90 days from seed to transplant size, though the seedlings can be transplanted a bit earlier in favourable weather. Although tiny, both types of celery seedlings are sturdy little things that are easy to harden off and transplant. But then another slow time comes for the celery gardener, because the seedlings often do not resume steady growth for three weeks. All the while they must be kept weeded and provided with enough water to keep the soil constantly moist. Once established, cutting celery grows a large root system that does a good job of finding and using water, so the plants require no special care in the garden. However, summer celery depends on a taproot that functions best in moist soil, and the stalks taste sweetest if they are deprived of light for two to three weeks before harvesting. These needs can be addressed in the garden by using a soaker hose frequently through the summer, and binding the plants with strips of cloth to block light to the hearts. Indeed, if I wanted celery that looks like its supermarket counterpart, I would need to always use self-blanching varieties, hill up soil and mulch around the base of the plants, and grow them in heavily fertilised, mucky-wet soil. Growing celery in my garden changed my thinking on this. 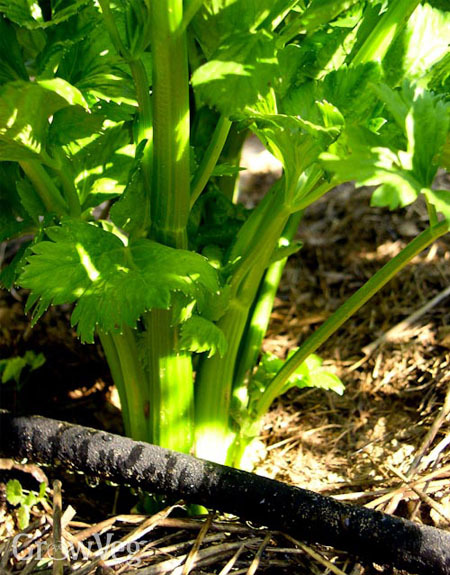 When grown in fertile, organically-enriched soil and provided with regular water, unblanched celery plants grow into a spray of crisp stalks, which can be cut as needed for the kitchen. Lately I’ve been enjoying an old heirloom called Giant Red, which is anything but self-blanching, but it’s a tremendous producer of crisp inner stalks with red color that looks great in cold salads. Summer celery has proven to be an excellent veggie to grow in containers. One plant will grow nicely in a 12-inch (30 cm) wide plastic pot, or you can grow several plants together in planters made from plastic storage bins (use the lid as a watering tray). Celery needs more water than other plants, so they benefit greatly from the moisture-retentive properties of plastic containers. Regardless of what you may have heard, re-growing celery from the store will not get you a healthy, productive plant. Instead, a few small stalks will grow from the nutrient reserves in the basal tissues, and then the party will come to an abrupt end as the mother crown starts to rot. A better approach is to grow real celery two ways, using the dark green stalks from cutting celery during the first half of the growing season, with traditional celery taking over from midsummer until fall. It’s the best way I know to have fresh celery available for kitchen duty day after day, all season long. "I cannot believe how easy it is to grow celery-even here in central Maryland. I started growing celery a few years ago on a whim. Now it is a "regular" in my veggie garden. I just love the intensity in taste and fragrance of fresh celery. Every spring I dig mine up and divide and share my plants. When spring tilling is done, back it goes along with some new seeds. Just love celery! Thanks Barbara for all the pertinent articles. I enjoy reading each and every one of them." "@Claudia M That's very interesting about overwintering your celery because they you would get a head start on the small seedlings. What do you actually do with the dug-up plants in the winter?" "Marsha, I let them stay in the garden until tilling time in the spring ( right now in central Maryland) when I separate them and return after my bed is prepped." "Ahch! I see that I didn't read very carefully! I somehow missed that they were biennial and could make it through the winter in the ground. Thanks for your kind reply!" "In climates only a little colder, regular celery will not make it through winter, but cutting celery will. I leave a couple of regular celery plants in the garden through winter, but they never survive nights below 16 degrees F (-9C). Cutting celery routinely survives 5 degrees F (-15C). " "Hi Barbara l have always wanted to grow Celery but always thought it to much trouble, but will it grow in my allotment which with this wet weather gets flooded or is this to moist." "I planted 2 different kinds of celery last year. I brought 12 small plants. They grew and grew and I had so much celery and shared with my son and family and neighbors. It was awesome. Every time I went outside to work in the garden, I was eating celery and tomatoes and peppers while working. I am hoping the celery will come back up this spring. I live in Wisconsin, so I will be looking once the snow is gone from the ground." "I've actually had great success with celery re-grown from the grocery store, using the cut and come again method with them: My four celery plants are at almost the two-year mark, though one of them has now gone to flowering and so will need to be replaced. I'm planning on saving the seed and seeing what might happen with them!" "How do commercial celery growers keep their celery stalks from sprawling. Would like to keep my celery stalks upright and tight. I have 1000 celery plants to maintain." "Tony, commercial growers grow their crop in heavily fertilized muck soil and pump the plants full of water. Then they wait for the perfect day and start harvesting the crop before dawn. It's a tightly engineered crop! You can't tie up a thousand plants as some gardeners do, so you should harvest and trim them down for sale when they look most promising. Ever heard of starting small? Good luck!" "Hello, first time grower I live in az and even in the fall it is still 89 most days. would this make a good indoor plant? and also is it possible to keep it as an in water plant? Or does it have to be transplanted into soil? " "Celery's growth plan includes a deep, stout taproot, so long-term life in water is not an option. You should try growing celery as a winter annual in your climate. Depending on your location and elevation, it may require some protection from cold, but will perform much better than celery grown during the warm season." "Plastic or ceramic drain sections placed over the plants provide light blocking from the stalks and prevent sprawling. I make mine about 300mm/1ft long. This simulates plants growing in a tight formation such as a commercial field..."
"I grew celery for the first time this year. I started from seed. Then planted into my garden. Then, two weeks later I by accident hoed the sprouts up!!! I was so sad. So In late May I started again with the seeds. I gave plants away in pots, took some to work and planted for my residents in the nursing home too. I did not know they would survive the winter so, I dug them up and put in plastic containers. I am not sure I understand the plastic ceramic drain to block light..... do you have any photos? What is your favorite receipt with celery? My plants never did go to flower or seed. Are they just too young or ??? Thanks for your insights and ansers Patti from OHIO"
"Patti, celery is a biennial, so plants that survive winter flower and bloom in their second year. Sometimes they bloom the first season, but only if they are exposed to cold. Celery does not usually survive winter in Ohio, so you did the right thing by digging up the plants." "We trench our celery in Manheim PA in early November for winter storage until it ripens to a pale yellow heart.We dig a trench a foot deep and a foot wide and pack the celery stood upright until its ready to sell from Thanksgiving through early February"
"My daughter is an experimental gardener and has cut the bottoms off of the bunch of celery and placed it in water to root. Greens appeared fairly soon and now roots are coming out as well. Does she just plant it in the ground and see what comes up? Wondering if plant will produce one more plant or more? Will this method work and if so how deep do we plant them?" "Pamm, you will need to watch the edges of the basal plate (flat cut part) to see if new plantlets form there. If they do, the mother plant can be cut into rooted pieces and replanted. If only the mother plant survives, it can be planted outdoors around the time of your last frost. It will grow into a leafy plant from which stalks can be cut, and will probably rush to flower when the days get longer." "I really want to try growing celery in containers this year. We use a lot of it and $4 a bunch is kinda steep. So, I'm hoping to get a good result. My question is: has anyone tried growing CELERIAC or celery root? I'd like to try that in containers too, but have no clue how it grows... Any help??" "Hi Barbara, I just wanted to say a thank you to you and all who commented on your advice on growing celery. I live on a small Scottish Island where cool weather and water is certainly not an issue. I planted far to many seeds and they all seem to have appeared. I will follow all the advice and look forward to having some fresh celery this year. Many thanks again. " "Hi Barbara I planted celery about four weeks ago, now the lower leaves are turning brown.do you think it could be caused by the liquid fertilizer that used. Help???" "If you think you overfed your celery, the first thing to do is to leach out those nutrients by overwatering it. A disturbance to the roots by an animal could cause low leaves to fail as well. Four weeks is not long for a celery to settle in, so you may want to give it more time." 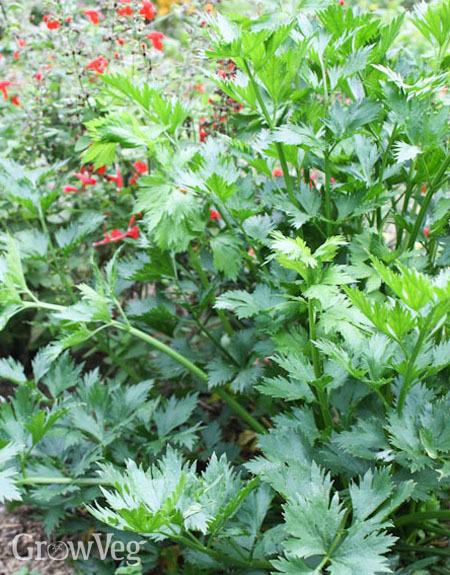 "I had celery plants appear suddenly in my garden so I don't know what variety they are. They grew quite long...about a metre long, and then a central stalk grew which sprouted lots of tiny flowers. My question is - when do the seeds come so I can harvest them? I had five plants grow but they all did the same and now I wonder if they can be reused or salvaged somehow. I just don't know when is the right time to do it. I am in the southern hemisphere so typical US might not help." "Jim, it takes only one or two celery plants to produce enough seeds for reseeding and harvesting, so you don't need to keep them all. Allow your healthiest plants to keep standing until the flower umbels turn brown and little seeds drop out. You may be close to this point now. Under good conditions, some celery plants will regrow after they have bloomed, but you will get better plants by starting anew with seeds. Good luck!" "what furtalizer should i use. for my celery cutting type. will it do good in the center of texas our temperture dont usually get below 20 degrees." "Cutting celery is not demanding in terms of fertilizer, but it will need regular water. It's a good choice for a warm climate." "Hello Barbara, i live in Nigeria and just learnt about celery from a friend. Tried it and loved it immediately, i planted one stalk to see if it will grow and it sure is doing well. How do i expand my garden since i dont have the seeds, do i need to buymore stalk to plant in my garden. your advice will be appreciated." "Idy, it is possible that celery seeds sold in stores as a spice will germinate, but you might consider mail-ordering some good seeds."